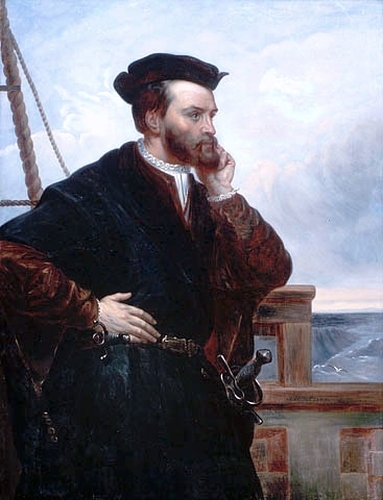 Jacques Cartier was born in Saint-Malo, Brittany, on the 31st of December in 1491. Cartier became a mariner, but when he married Mary Catherine des Granches he improved his social status, came into money, and was able to become an explorer. Cartier’s maiden (first) voyage as an explorer set sail on the 20th April 1534. He had been commissioned by the king to discover a western passage for trade between Europe and Asia and so sailed to the New World of the America’s. The king was particularly interested in discovering gold and spices. Cartier and his crew took 20 days to reach land. The crew made a pit stop at Iles aux Oiseux which is now a bird sanctuary, and during the stop, Cartier and his men killed over 1000 birds. Cartier met a number of indigenous peoples once he arrived at the main land, and traded with them. He and his crew set sail after only a couple of months, and returned to France in September of 1534 with two captives from the voyage. Cartier’s second voyage set sail in 1535, and lasted one year. The fleet included three ships and over 110 crew members. The crew sailed to the New World, and explored the land of modern day Canada. Cartier did come into some difficulties on his expeditions around the land because of unforeseen river rapids and thick ice which he and his fleet could not sail through. As a result, he was unable to sail to China via his planned route. However, he was the first European to describe and map the Gulf of Saint Lawrence and the Saint Lawrence river. Cartier returned to Europe in 1536 with gold and foreign goods. Cartier’s third and final voyage set sail in 1541 and again lasted for one year. He had been ordered to return to Canada to help with colonization efforts. Passage through to China was no longer part of the plan. During this voyage he claimed the land of modern day Canada for France and planted crops to aid colonization. He and his fleet returned to France in 1542. It was not until 1609 that a colony actually appeared on Canada’s shores. After his final voyage Cartier stayed in Saint-Malo where he worked occasionally as a Portuguese interpreter. Cartier died on September 1st 1557 at the age of 65.